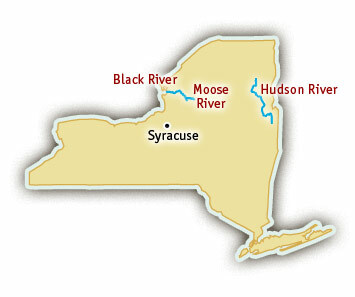 The Moose River’s source starts high in Adirondack National Park and makes its way through the counties of Hamilton, Herkimer and Lewis before finally joining the Black River. Located two hours from Syracuse, and 2 1/2 hours from Albany, the Moose River is a fantastic New York whitewater rafting destination. Rafting enthusiasts of all kinds will enjoy the Moose River because it features two very different sections of white water runs. The most popular section of the Moose River is the Middle Moose, near Old Forge, about five hours north of New York City. Families, youth groups, and whitewater lovers of all ages frequent the Middle Moose section of the Moose River. Class I-III rapids offer fun and excitement for first-time rafters and veterans alike. The Moose River’s Lower section offers a completely different New York rafting experience. The Lower section is an intense and action-packed whirlwind of Class IV-V rapids that will test the skills of adrenaline seekers. The Lower Moose’s challenging whitewater requires that rafters attempting its fast water and big drops have had previous Class IV experience and are in good physical shape. Middle Moose River rafting trips are offered throughout the spring and summer while Lower Moose River rafting is only available when the snow melts in the early spring, typically in April.